While smartphone technology has been available since 1993 with the IBM Simon it wasn’t until the Blackberry smartphone was released in 2002 that smartphone technology began to gain traction in the marketplace. In 2006 smartphones only represented 6% of all US mobile phone sales, this almost doubled to 11% the following year when the Apple iPhone was released. Smartphone adoption amongst mobile phone owners in the US grew from 42% in 2011 to 81%. To put this growth into perspective consider that landline telephones took 45 years to grow from 5% to 50%. Organisations and professionals need to consider how mobile technology influences their industry and how their customers are using mobile devices. Online shopping accounts for approximately 40% of mobile usage in mobile browsers in the UK and 36% of mobile usage accounts for 36%. Reading emails and travel booking accounts for 31% and 24% respectively while 16% of mobile usage is used on social networks according to Deloitte. It’s safe to say that mobile advertisers now have a myriad of opportunities to target engaged mobile users. In spite of its rapid growth, usage and importance, mobile is still a young, perpetually developing industry. Operating systems, applications and technologies are being released rapidly and smart organisations are turning to mobile specialists for support. In fact, global mobile internet ad spending is forecast to reach $195.55 billion in 2019 – up from $ 19.2. But with more companies getting onboard with mobile ads and app users tend to use only 5 apps regularly, the growth is predicted to plateau. While the Windows Phone and even Blackberry may still be popular amongst the UK and US smartphone users, iOS and Android have been leading the way in terms of market share sales in the last five years. For organisations venturing into foreign markets, it’s important to understand mobile market share and usage within these markets. For example: in Asia, Android tends to be the dominant operating system with iOS ranking third or even fourth in some Asian countries. The concentration and spread of market share vary greatly within the region and there can become anomalies to the rule. In South Korea, Android dominated the market share in 2010, however, the Windows Phone has over 54% of the market share. The below graphs from Stat Counter explore the market share of the world’s biggest markets. Mobile and tablet operating system in China April 2017 – April 2018. Source: StatCounter. 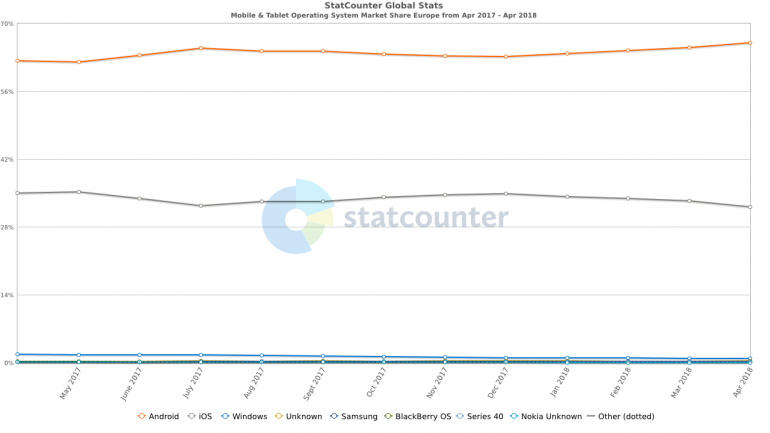 Mobile and tablet operating system in India April 2017 – April 2018. Source: StatCounter. Mobile and tablet operating system in Japan April 2017 – April 2018. Source: StatCounter. Mobile and tablet operating system in the USA April 2017 – April 2018. Source: StatCounter. Mobile and tablet operating system in Europe April 2017 – April 2018. Source: StatCounter. 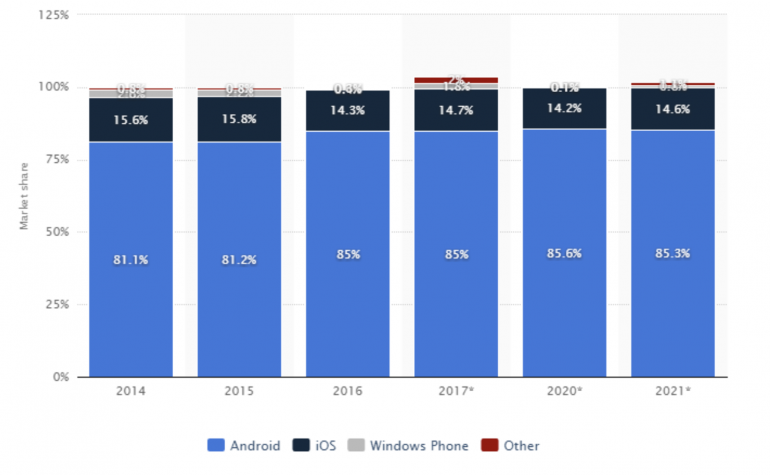 Android is predicted to be the dominant mobile operating system for the foreseeable future with an 85.3 market share by 2021. Apple’s iOS, which is exclusively used by Apple hardware will remain relatively stable. According to PricewaterhouseCoopers, Mobile advertising generated over $72 billion in 2016 – a 22% increase on the previous year accounting for over have of global digital ad revenue. Its estimated that this pattern of growth is set to continue generating an astonishing $247 billion by 2020. 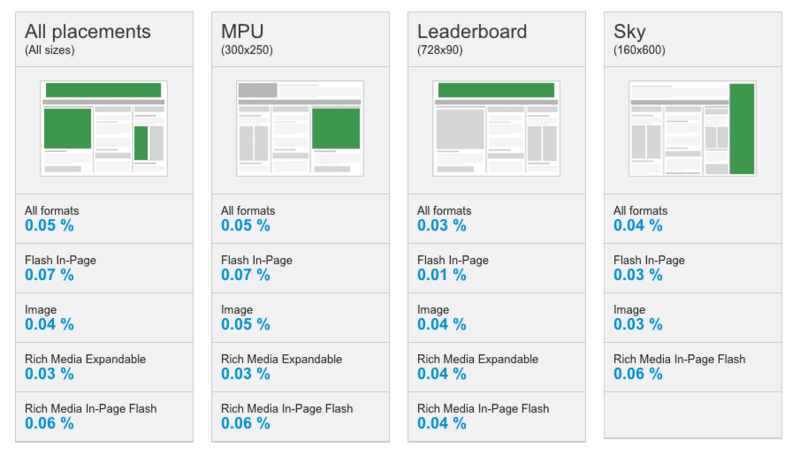 Even on computers, standard banner ads, which are typically unobtrusive and don’t get in the way of content have a very low CTR (click-through rate) of between 0.1% – 0.7%7. Advertising that distracts the user or gets in the way of content is considered particularly obtrusive on mobile devices which are considered to be more private and personal than computers. Organisations must consider the value that they can add to user’s personal experiences and often social media marketing and mobile applications (or web-apps) are far more effective than advertising and potentially a lot cheaper in the long term. Facebook announced it had 1.65 billion monthly active users in 2016 and reported 54% of its users access the platform only on mobile. With mobile-only social media apps such as Instagram and Snapchat becoming just as popular as Facebook, Twitter and Pinterest, social media marketing is now becoming increasingly important to marketers and is no longer considered a non-traditional marketing channel. With the growth in mobile traffic, the nuance of social media has evolved to encompass messaging apps such as Facebook Messenger and WhatsApp as messaging between users outside the traditional format of SMS significantly increases. Bought by Facebook in 2014, WhatsApp is an end-to-end encrypted messaging service allowing users to send a variety of media including text, photo, video, documents, location and voice calls and boasts an impressive 1 billion users in over 180 countries. WhatsApp Business was recently launched in January 2018 as a completely separate version of WhatsApp but works in the same manner by connecting small businesses to customers. Facebook’s messaging offering, simply known as Messenger, offers similar features as WhatsApp and has recently introduced video calling. Users in the US are even able to send and receive money to other Messenger users. While owning two messaging services may seem like a contradiction in terms, Messenger heavily relies on the relationship its users have with their Facebook friends and the Facebook ecosystem as a whole. Instagram, which was bought by Facebook back in 2012, has seen huge popularity and growth in Western markets. The photo filter app which allows users to upload and share photos using a suite of filters and editing tools is widely popular with influencers. It’s recently added commerce features, where businesses can add ‘buy now’ buttons to their posts, as well implemented sponsored ads in order for businesses to target their customers on the photo-based social network. Discovery – TripAdvisor, Yelp etc. Utilities – maps, clocks, email, camera, calendar etc. Games, entertainment and social networks are attributed to the most time spent on mobile devices. Applications designed to entertain or add value to consumer’s lives have the ability to build long-term brand engagement in a far more positive and useful manner than advertising. Take into consideration Nike’s “Nike +” application which syncs with selected Nike shoes to monitor speed, distance and calories burned which Nike credits for 30% growth in its running division. Or the Starbucks mobile app which accounted for 25% of total in-store purchases in 2016. Regardless of whether these apps have been monetised or not, they provide users with a unique, memorable opportunity for brand interaction every time the app is launched. These apps can also be used creatively to run competitions, build social media communities or even run personalised advertisements in a more creative manner than traditional paid advertising. While organisations are increasingly embracing mobile applications, the developer communities have been highly active for years, which means there is no shortage of technical talent. There are several key considerations that should be explored before starting development. Add Convenience: How can your application make your customer’s life easier? Does your app make it easier for them to find out specific information? Does it include a store locator? Pricing calculator? etc. Take inspiration from your bank’s internet banking app, airline apps, sports apps and even your competitors and note what they do right to make your experience more convenient. Offer Unique Value: Are there things that a mobile application can offer your customers that traditional computers cannot? Is your app able to take advantage of location-based services, QR codes or mobile social media in a unique way? The most impressive applications tend not to feel like traditional marketing communications and offer users something useful and unique. Provide Social Value: With social media representing the second largest portion of mobile usage (behind entertainment), it makes sense to provide social value. What this means is integrating popular social media features (where relevant) within your app. This includes things like ‘checking in’ with Facebook, posting a Twitter update directly from your app or the ability to send ‘social gifts’ to friends and family. Swedish company Wrapp allows users on Facebook to send promotions to other users giving them discounts and specials across a large number of retailers and service providers. Offer Incentives: Countless apps fail because they never reach their intended audience. How you choose to reward your users (aside from making a useful app) for interacting with your app will go a long way in keeping them inspired. If you operate a retail company you could offer a product discount for downloading your application. Or you could automatically enter a draw to win a prize. If you offer in-app purchases perhaps you can provide users with a free sample or a gift? It’s important to consider how your app entertains users. While it might seem obvious to make an app that revolves around your brand, organisations that put the emphasis on fun tend to reap the benefits. Beer brand Corona Extra created the Beach Break app helps users transform the beach from a physical place to a state of mind. 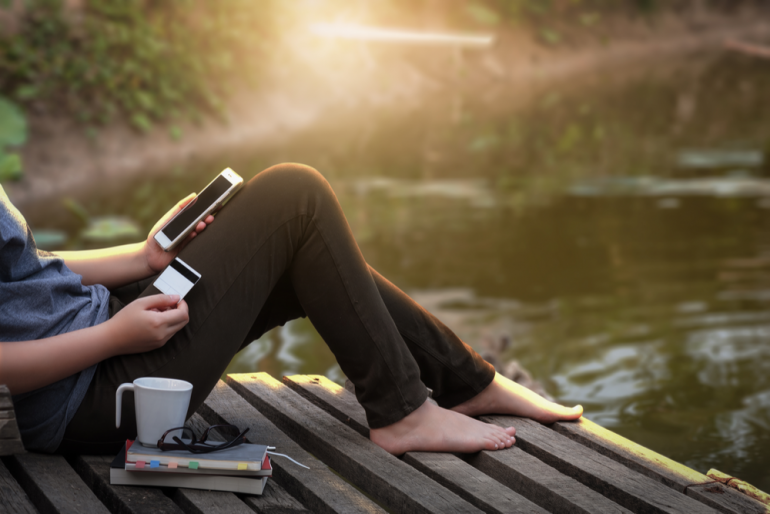 The app rewards users for unwinding, unplugging and logging out of programs – users collect points by checking in at specific venues, logging out of apps like Facebook or uploading photos of Corona beer. Points can then be redeemed for branded products and prizes such as spa appointments or sports trips. This has the ability to be far more meaningful and memorable than banner-ads. Games also offer unique monetizing and advertising opportunities. Game developers often make more money from in-app purchasing than actually selling the apps. In-app purchases typically contain in-game content such as items that can be used within the game, extra levels or chapters, character-customisation. Developing a mobile application requires organisations to implement new skill sets that they are often unfamiliar with. From the outset, this undertaking can seem daunting (perhaps another reason why some organisations are slow to capitalise on mobile) but with the strategic planning and the right team, app development need not be an ordeal. While larger agencies typically charge a premium for app development (often including strategy and project management) freelance app developers are often cheap and easy to find using freelance websites such as Elance or Odesk. This is due to the fact that developers have adapted to mobile far quicker than agencies creating an excess of developers looking for work. Perhaps the biggest challenge when it comes to app development is choosing which operating system to support. The decision is currently between the iOS App Store and Android’s Google Play Store. To complicate matters further Apple’s App Store requires you to meet a number of requirements before you can release your native app and it is very difficult to create internal or offline, non-consumer applications on iOS devices. One solution to overcome Apple’s application process is to skip the process altogether and create a ‘web-app’ or ‘hybrid-app’ which is essentially a responsive website created specifically for mobile devices. There has been a debate between whether to use native apps or web apps for the last several years; however, this should not be considered an either/or argument as there are different reasons to use each method. There are effectively three ways to prepare your applications for international deployment: manual translation, software translation and traditional localisation. Manual translation is suitable for simpler/smaller apps or apps that are only going to be translated into a few languages. Manual translation consists of using translators to manually translate the content of applications. While this is often the simplest method it is not scalable thus is not suitable for larger applications that are being updated and expanding regularly. Using software to translate your applications into multiple languages is the quickest way to localise your app. However, it is the least accurate method and cannot properly take into consideration locale-specific idioms and layout modifications. If accuracy and professionalism is a priority, then this is not a suitable translation method. This is the most flexible, accurate and scalable to localise applications but can also be the most time-consuming and expensive. Traditional localisation effectively involves creating multiple instances of your applications for each locale. While the complexity and costs involved may not be feasible for some smaller organisations, this is the most professional localisation method. Given the myriad of different mobile devices (different screen sizes, operating systems, rendering methods) the key challenge when localising applications revolves around app degradability and limited screen real estate. If you are translating to a language that uses larger words with more characters your applications need to cater for this without negatively impacting the user experience. The above links explore methods and practicalities of developing applications for the international market in a flexible, responsive way that caters to different lengths of copy. Design a flexible layout; you are able to create multiple instances of your layout to cater to different languages. Create multiple ‘resource files’ to store different user-interface files for each locale you intend to support. This means that if a user uses your app in a different language than the default language it will load different user interface assets specifically designed for their locale. Ensure your app can accept user-generated text in any language. Test your localised app using an emulator beforehand. It’s estimated that by the end of 2018, global mobile commerce revenue will reach $669 billion and in the EU, while 41% of online sales in the travel and retail industry will take place on mobile or tablet by 2021 according to Forrester data. While some m-commerce sales would simply replace sales that would usually have been made on a computer, mobile sales offer a number of advantages to consumers and retailers. It’s also important to consider that while global mobile commerce conversion rates are not too dissimilar from desktop – 3.63% desktop vs. 3.17% smartphone – conversion rates by region and change dramatically. Research from Monetate suggests users in the US convert at a rate of 1.14% on smartphone compared to 3.37% on desktop and the UK, 2.52% on smartphone compared to 5.15% on desktop. It’s important to consider the customer journey on a mobile device, especially in markets such as China where mobile commerce commonplace. Conducting thorough research on the mobile shopping behaviour of your target market will be vital to your success in incorporating omnichannel strategies is now top of the list for many international businesses. As users begin spending more time shopping online, more e-retailers are ensuring that m-commerce is not only possible but also specifically designed to improve the mobile purchasing process. People use their mobile devices in a different manner to computers and in different situations. Organisations who understand how their customers want to be interacted with have the ability to provide the most effective and enjoyable m-commerce experience. The below introduces some guiding principles to keep in mind when developing a new m-commerce platform or migrating an existing e-commerce platform for mobile. Different locales, groups and industries use different mobiles devices. For instance, While Blackberry boasted more than a 40% share in the mobile market, this number soon fell to 1.8% by 2014. Android devices such as Samsung, Huawei, Oppo and Vivo dominate the global market along with the Apple’s iPhone. By completing ongoing research and reviewing existing mobile/website analytics organisations can gain a greater understanding of how people are interacting with their brands and use this information to enhance and develop strategies. Companies with existing e-commerce stores can evaluate existing website analytics to understand who is making purchases via mobile and what mobile devices are being used. This is a good starting point. Mobile stores should be designed to function specifically for mobile devices. This will inevitably mean that there are some differences between a brand’s e-commerce and m-commerce store. There is nothing wrong with slight variations between mobile and non-mobile sites and stores but it is important to ensure brand consistency is maintained between platforms. Brand consistency is essential in building and maintaining brand trust, familiarity and ease of use. Limited screen real estate, 4G speeds and touch screens often makes unnecessary complexity less forgivable on mobile devices than on computers. Organisations should take care to ensure users are able to easily navigate products, account settings and checkout. For some industries such as tourism, hospitality and transport, speed is particularly important as customers will often make bookings on the move. With inbuilt GPS technology, it is possible to personalise the customer experience based on their location. Retailers with physical premises can use m-commerce and apps to run location and customer specific promotions in conjunction with physical stores. Location services provide the opportunity to run social, personal and promotional activities in a unique and creative manner. Organisations should take care to ensure that the use of this technology adds value to the customer’s m-commerce experience. It is common for online stores to be built on a responsive template that allows for mobile purchasing. This is a great way to save resources as it means you do not need to develop a unique site for mobile and often works well, however, this is not always the most effective solution. Organisations should take care to ensure that mobile strategy is not simply an afterthought or extension of the e-commerce strategy. The unique nature of mobile should be taken into consideration, as, in some instances, a different strategy and approach may be more appropriate than a responsive website. This may mean having unique features for mobile or implementing technologies such as ‘one-click checkout’ or saving user preferences into the cache and providing a more user-oriented, personalised mobile shopping experience. Surveys and customer feedback play an important role in developing new e-commerce offerings and strategies. To better understand the potential of mobile within key demographics organisations should ask for feedback on the mobile experience. This could be as simple as a feedback form presented after checkout. Mobile devices, operating systems and technologies are being developed at an extremely rapid rate. Every year hundreds of new handsets are released along with several operating system updates for each platform. Occasionally there are major ‘game-changing’ enhancements in the web and mobile world that have a greater impact on the way that business is conducted via mobile. HTML5 and Cloud Computing are two examples that have emerged in recent years. Biometric technology is commonplace on devices including Apple’s iPhone and has already had a dramatic impact on the way its users pay for goods and services on-and-offline. It is important for organisations involved in mobile and mobile commerce to allocate time to research and understand the impact that new technologies, handsets and features have on mobile. M-commerce stores are responsive websites or websites developed specifically for mobile, not native applications. This means that the localisation process is derived from the website. As with application translation, the general concepts remain the same. As most online stores follow a similar layout and purchase methods full localisation and translation is sometimes not necessary for smaller stores selling niche items. Providing products in different currencies and providing users with a localised ‘checkout’ page can suffice in these cases. However, for larger stores with wider audiences full localisation of product descriptions and promotions will typically be necessary. There is a myriad of ways to approach web translation and most advanced e-commerce platforms will provide the technical framework within their CMS (Content Management System) to allow for multiple languages, currencies and postage prices. The most important consideration for handling the shift from e-commerce store viewed on a computer to m-commerce store viewed on a mobile device is how the responsive design is implemented. The most effective way to ensure that this shift works effectively is through testing the online store on multiple devices and in all supported languages. These days, responsive technology is much more reliable but developers will often need to make amendments to the mobile layout. Smartphones and tablets make up a part of normal everyday life for the majority of the developed world. There is no denying the impact that mobile has, and continues to have on business, personal life, advertising, marketing and communication. As this technology evolves and becomes ‘smarter’ so too will organisations need to develop a keener awareness on how to leverage this technology to reach their audiences. A shift in the way that organisations approach the notion of advertising needs to be considered with mobile; traditional advertising is not effective, it is also perceived as offensive when served to people’s personal devices. This marks an evolutionary step in the way that people wish to be communicated with and organisations that are taking bold, creative steps to engage with their audiences are being rewarded. Relevant social media marketing, applications and games are leading the way in terms of providing engaging, personal platforms for brands to communicate with, not to, their audience. As the technologies and tools become streamlined, integrated and user-friendly, developmental challenges will inevitably become easier to solve allowing organisations to focus on strategy. Research and understand your market before developing. While Android is the worldwide leader it is not the leader in many countries. When working internationally take care to localise and not just ‘translate’ your content. If credibility and customer perception are important to your brand ensure you use qualified human translation and localisation services. Do not underestimate the intricacies of localisation. Think social media marketing and applications, not advertising. Customers do not want to be sold to, particularly on their mobile devices, which are considered personal. 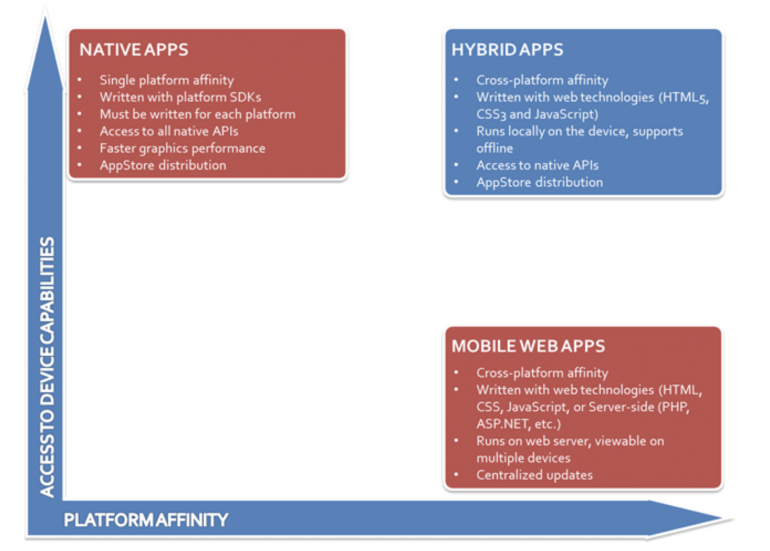 Understand the differences between native apps, web-apps and hybrid-apps before committing to a given path. Consider how your application will enhance, engage or entertain users. The most successful applications enhance the daily lives of users.